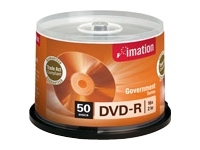 Imation's Government Series DVD-R discs are guaranteed Trade Agreements Act (TAA) compliant. Often data needs to be preserved for extended periods of time, like research data, critical information and documents. Imation's media offers you great performance with low failure rates and the confidence that the media is consistent with federal regulations. DVD-R, a write-once format, is capable of producing pre-mastering discs and is ideal for high volume data storage.